Inspired by Inanimate's old Booster Pack Game over on the old forums, the challenge goes as follows. The winner of the round creates the set name, a brief world/setting where the set will take place ( a few sentences will do) and the first common card ( ). 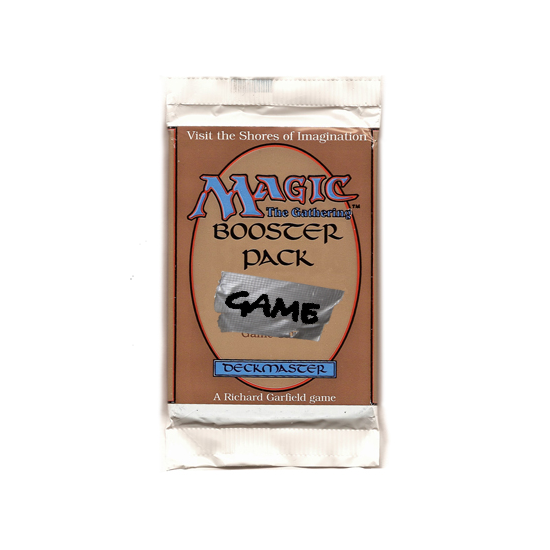 Other users create the contents of a fictional booster pack from that set. The booster pack is to be created in order: 10 common cards ( ), 3 uncommon cards ( ) and then one rare or mythic ( or ) for a total of 14 cards. Remember that the set creator designs the first common. Once the booster pack is complete or a week has passed, the Set Designer votes on the 14 new cards and selects a new winner. It is nice to do a card review for each card (at least one sentence) to explain your choice of winner. The winner of that round will then create the next world/setting for the next set. You have to work well with each card before you - as the pack goes on, people will be introducing mechanics, themes, and flavor to keep in mind when designing. The goal, of course, is to end up with a well-designed, cohesive, and most importantly, exciting booster pack, one that feels as if it actually came from a real set! You do not need to use renders or art. Doing so should not give a user an advantage. You can make more than one card per booster, but not back to back. Two warring nations lie on opposite ends of a tremendous expanse. Weitzland is a nation of academics and merchants. Ackerstadt on the other hand is a nation of soldiers and engineers. The expanse between the two nations, known simply as the Warmarch is riddled with ancient weapons, machines, and relics of a bygone age. The two sides quarrel over its unparalleled resources and both vie for dominance of the plane. Reveal the top four cards of your library. You may put an artifact, enchantment, or land card from among them into your hand. Put the rest into your graveyard. Reckon I'll get us started, then. Whenever a creature paired with Spiteful Chevalier dies, that creature's controller loses 1 life and you gain 1 life. "The rest die quickly. You will suffer." , Tap an untapped artifact you control: Ackerstadt Gunsmith deals 2 damage to target attacking or blocking creature. "Interesting. This machine can launch a highly propelled projectile at any direction I want, and all I have to do is pull... this." Question: Does each winner have to create a new plane? Yep. If you win, you need to design a new plane. • Mechanical Sabotage deals 3 damage to target creature. Tap target creature. If was spent to cast ~, that creature gets -3/-3 until end of turn. "A true soldier doesn't let the enemy shoot twice." EDIT: As of this edit (up to Yoshi's card) we have 7 commons. That leaves 3 commons, 3 Uncommons, and 1 rare/mythic. Whenever CARDNAME deals combat damage to a player, you may pay . If you do, create a 1/1 white Soldier creature token. His ability to draw others to him is matched only by his muscle. Make sure to check how many cards of each rarity have already been done! Reveal the top card of your library. Creatures your opponents control get -X/-0 until end of turn, where X equals the revealed cards converted mana cost. Put the revealed card into your hand. Whenever equipped creature attacks, add one mana of any color at the beginning of your next main phase. As long as ~ is equipped, it gets +1/+1 and has menace. The rusted relics of the Warmarch are his weapon cache. Whenever CARDNAME attacks, you may pay . If you do, target creature blocks it this turn if able. Incidental mark synergy for what I think would be a cool limited archetype. Whenever one or more creature attacks you, if Weitzland Bandit is untapped, you may unattach target Equipment from target attacking creature and gain control of that Equipment until your next end step. If you can't, put a +1/+1 counter on Weitzland Bandit. Merchants desperately try to avoid the ogre territories, for they know all that they will find there is their doom and bankruptcy. The counter is trying to represent the ogre's anger when they discover that the merchants have nothing to take. Also I thought we were going enemy colors but eh. At the beginning of combat on each player's turn, prevent all combat damage that would be dealt to or dealt by target creature this turn. It will quell the bloodshed, one combatant at a time. EDIT: I did it myself. Without further ado here's my card by card rating with my pick of our first winner. 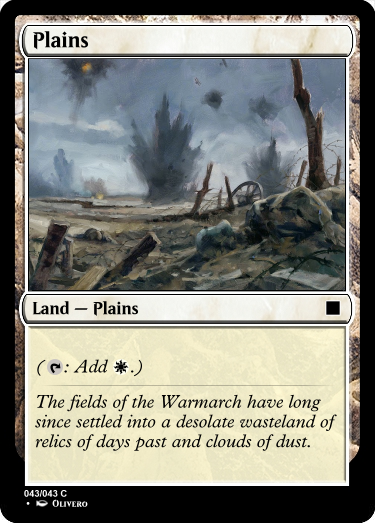 Scout the Warmarch: My card, along with the discussion, reinforced the idea of scrounging a battlefield for relics in the form of artifacts, enchantments or places. Let's see how this went. Spiteful Chevalier: a new mechanic Mark is introduced and I like it. Pairing it with an opponent is a neat idea. The one thing is that it's hard to track. Soulbond at least makes it easy in that you can just stick your two things together. I do like the card and I like how it plays and evokes the battlefield/chess feel. Ackerstadt Gunsmith: Name, flavor and mechanics all tie up really nicely. I like how it introduces the concept of using artifacts as alt tools, like the Quicksmith duo from Aether Revolt. Good stuff but it probably wants to be an uncommon. Mechanical Sabotage: A common Abrade type effect. Would be stellar in limited and the flavor is good. It is a card that exists however. Disarming Blow: Good common removal, good flavor too. Another good solid pick in limited. Biggest thing here is we're getting told that multicolor is now important. 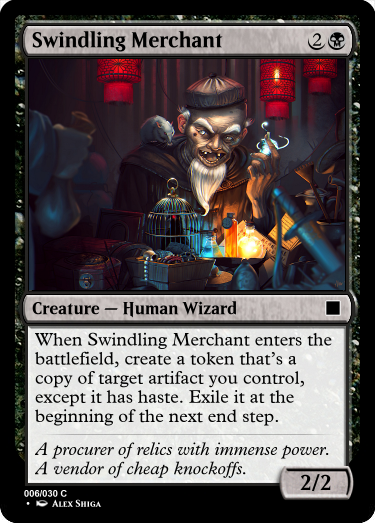 Swindling Merchant: Love the card. If you've seen TOJ, you'd know I love copying stuff. Got a feeling that this should be an uncommon however. Other than that, totally superb card. Ackerstadt Bruiser: Good follow up to Disarming Blow's multicolor theme and using it the same way. I like this "pay other color cost" to get a bonus just as much as I did back in shadowmoor days. The card's solid and is definitely a serious threat. Complicated Explanation: Can completely swing an attack around and draws a card. I like it a lot. Would have loved a flavor text on there. Are the enemy soldiers getting lectured to death by an academic xD? Prismatic Knife: Great card that hits all our current themes (multicolor and relics). I think it would have worked even better if it added it immediately and had the "doesn't empty" rider so you could use it with Disarming Blow and the Bruiser in combat. Ackerstadt Scavenger: Our first multicolored common! It has good synergy with relics obviously. Some similarities to the Bruiser however (both becoming 3/2 menaces) and sharing a namespace. Relentless Hunters: Definitely some solid Mark synergy and a very solid card. It's definitely super solid and can eat blockers all day long. The 2 mana payment balances it out. Weitzland Bandit: Flavorful and solid, this does punish attacking a lot though for an uncommon. I think it'd probably want to be a rare since Equipments would be quite prevalent. Warmarch Wanderer: I like this card a lot. Being able to either turn one of your own creatures into a perfect blocker or neutralize the opponent's best creature is really strong. Along with the 0/4 body this would be a tough creature to kill. Chances are either it should only affect one of your own cards or be moved up to rare. 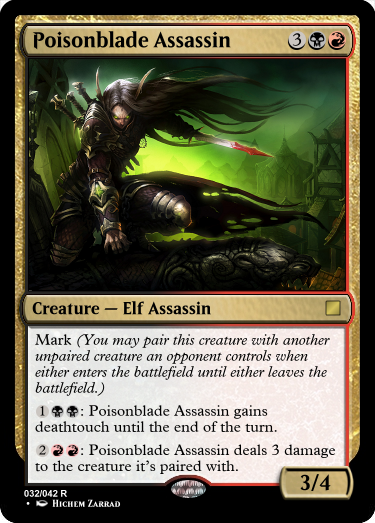 Poisonblade Assassin: At worst you get a solid creature with 2RR deal 3 damage to a creature. At best you're killing their most recently played creature each turn. Definitely solid, definitely worth of a rare. And that's the pack! To me the card design that fit the best were Ackerstadt Gunsmith, Prismatic Knife and Swindling Merchant. While I was hoping to see some more sweet Relics (I noticed no enchantments or lands, and only one equipment) I liked where we went with this. My choice for winner is gateways7 and the Swindling Merchant. Though it should probably be an uncommon, I loved the flavor and the possibilities for sick plays are theoretically very high. I also want to give a shout out to fluffy for the sweet Mark mechanic and for others for playing nice with it throughout the booster pack. Thank you so much for the win! Anyways, here's the next set. A planar portal exists in Veskeza linking to another plane, one in which rulers throw all they deem unfit to live in society into that portal. 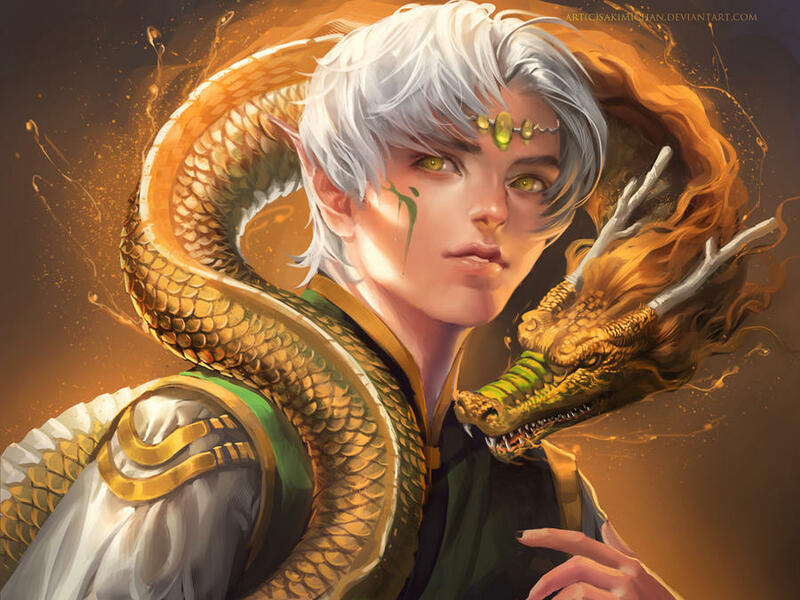 The plane of Veskeza is now filled with the undesirables of the other world - criminals, traitors, and anyone who speaks out, effectively making the entire plane a prison. In the near-uninhabitable conditions of Veskeza, each person locked there must constantly fight to survive. When enchanted creature deals combat damage, destroy it. "Normally, you would be sent to the other realm as penance for your crimes. However, you deserve a much worse punishment." Viciousness - Whenever a creature dealt damage by Vile Reprobate this turn dies, each opponent loses 1 life. "Pity is for the weak." Distribute two +1/+1 counters among up to two target creatures you control. "Don't ask what's in the grub, kid. Let's just say you'll be lucky if it's cockroach." Equipped creature gets +1/+0. Whenever equipped creature deals combat damage to a player you may pay . If yuo do, draw two cards. CARDNAME enters the battlefield with a +1/+1 counter on it if it exploited a creature. "It's kill or be killed here, m'lad." , pay 2 life: Create a 1/1 Black Human Rogue with deathtouch. His dark dealings from the past lead to paranoia in the present. "Even on the other side of the portal, we must strive to exercise adequate penology." I randomly created a name for a major facility that handles crimes from the "good" side of the portal. I figured they'd still send some "cops" to quell surviving prisoners. Just imagine some rich, paranoid pencil-pusher from the "good" side pushing the governing military force to regularly send poor soldiers to make sure nothing could disrupt the system from the "bad" side. As it has been a week, I'm going to say entries are closed and that I'll judge in a bit. And now, the card by card judging! Locked Away: This was the card I made. The reason I didn’t try to present a theme with it was that I wanted to see where everyone decided to take the theme with the flavor I gave, so I just made a simple removal spell. Vile Reprobate: Our first mechanic, Viciousness - the Sengir Vampire mechanic. It’s a simple card that demonstrates the mechanic well. It also demonstrates a theme of combat and death focused gameplay. Forage for Food: The next mechanic, Carrion, is one that most definitely fits both inside both the theme of the set, where people have to fight to survive, and the theme of combat, attacking, and death that has already been shown with Viciousness. The flavor here is on point, and the card seems fun and simple to play. 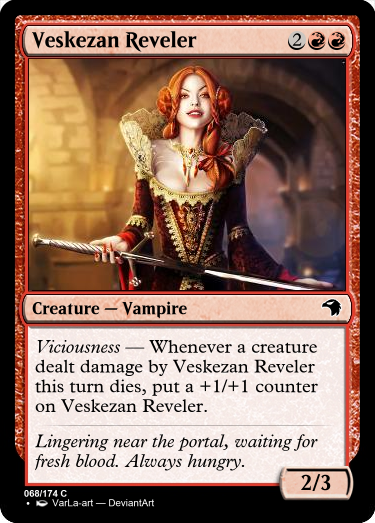 Veskezan Reveler: A return to Viciousness, this is the exact same ability as Sengir Vampire’s. At 4 mana, this seems a little underpowered in comparison to Sengir Vampire (a 4/4 flyer for 5.) However, it has flavor that fits the world, and seems fun. Escapist Key: This is pretty much a better Rogue’s Gloves, and Rogue’s Gloves is an uncommon. However, flavor is there, and it seems fun to play with and play around. 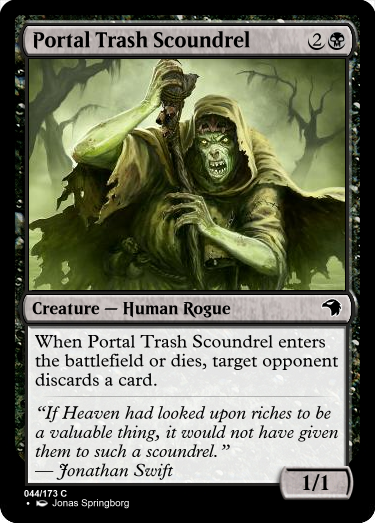 Portal Trash Scoundrel: Cool card! It works well with both Carrion and Exploit, and feels like a Mind Rot on a stick, except more fun to play with. Veskezan Elite: This seems really powerful for a common. The fact that the tokens have deathtouch mean that they kill anything, which seems a little too strong. Oress Enforcer: Our final mechanic of the pack is detain, and while it doesn’t fit with the other themes, it works well on a flavorful level, and the flash makes it seem like a really fun card to play. I think the only problem with it is that the detain ability means that you can’t successfully use the ETB after attacks, like you would with many other flash cards. Out of the cards in the pack, some of my personal favorites were Forage for Food, Iron-Bar Ruthless, Portal Trash Scoundrel, and Oress Enforcer. However, out of all of them, my personal favorite was fluffydeathbringer and Forage for Food, because of my affinity for interesting flavor in cards.